Every year in the 2nd week of July, Green Bay Trout Unlimited teams up several local outreach services including the PALs program, Izaak Walton League of Brown County, Green Bay Exchange Club and Festival Foods, to provide a Kid’s Fishing Day to less fortunate and disabled children. In 2014, we held our 23rd annual event with over 75 kids attending. Everyone present experiences a beautiful afternoon of enjoying the outdoors, catching fish and having a light dinner. All fishing equipment, snacks, and a meal are provided to the children from the above sponsors. A picnic consisting of hotdogs, chips, beans, cookies and beverages follows in the afternoon is provided by Festival Foods and the Green Bay Exchange Club of Green Bay. 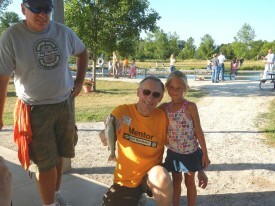 Trout Unlimited provided the refreshments, fruit and the fishing bait. 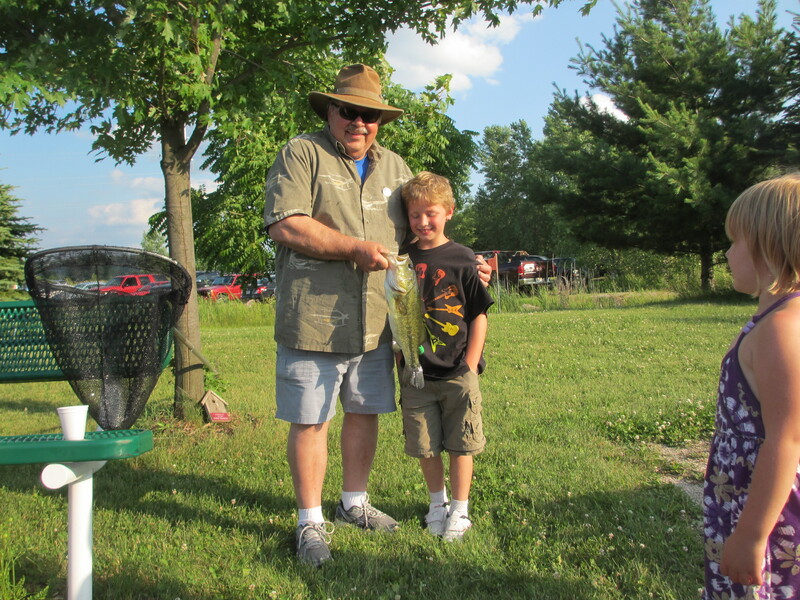 The Brown County Chapter of the Izaak Walton League provides the great facility and made sure there were plenty of fish to catch. Tons of Bluegills are caught but you can always plan on one or two big fish getting on the hook. In past years, a 15 inch Small Mouth Bass, 16 inch Large Mouth Bass and a 15 inch Rainbow Trout. Many organizations and volunteers come together to make this event possible via a nice partnership that has evolved over the years to ensure a smooth running event that everyone walks away from with a sense of satisfaction. We would like to thank everyone involved ! Glenn, young lady and her trout ! Dedicated Trout Unlimited members who are regulars in helping include: Steve Abts, Pat Hill, Larry Kriese, Adrian Meseberg, Dennis Gusik, Jack Koivisto, Bill Holton, Paul Kruse, Mike Renish and Lee Meyers. Please click on the Google Map for directions to the Izaak Walton ponds.